Vinegar comes from the French word vinaigre meaning sour wine. 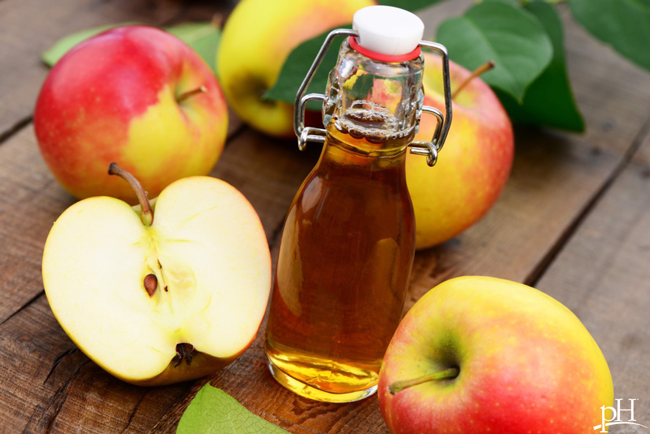 It can be made from almost any fermented carbohydrate - wine, molasses, dates, pears, berries and apples have all been used to make vinegar, with apple cider vinegar being one of the most popular kinds. The benefits to apple cider vinegar are abundant. Proponents use it for everything from curing hiccups to alleviating cold symptoms, and claim it can help them fight diabetes, cancer, heart problems, high cholesterol and weight issues. Studies are beginning to affirm some of the benefits, and no doubt apple cider vinegar will be the subject of numerous studies in the future. There is evidence that fermented foods such as apple cider vinegar containing lactic acid or acetic acid can lower blood sugar (glucose) by helping store excess glucose in the liver. This reduces the body’s rate of glucose production and absorption. A 2004 study that appeared in Diabetes Care measured the effects of vinegar on blood glucose after a meal. Blood glucose levels were taken one to two hours after a meal. The participants were insulin sensitive (normal response), insulin resistant (pre-diabetic), or Type 2 diabetics. They were required to either drink apple cider vinegar or water with a sugar substitute before eating a buttered bagel and drinking orange juice. The insulin-resistant group that drank the vinegar before their meal had increased insulin sensitivity for an hour after eating. The Type 2 diabetes group also saw a slight improvement, but the biggest effect was seen in people whose insulin response was normal and those who were insulin resistant. This study demonstrated that vinegar does seem to significantly improve post-meal insulin sensitivity in people who are insulin resistant, which suggests apple cider vinegar may work in a similar way to anti-diabetic medication. Additionally, vinegar may make food healthier and aid the body in digestion, according to the American Diabetes Association. This may be because vinegar affects the rate of gastric emptying (food leaving the stomach), which affects blood sugar and insulin. Vinegar contains 5 percent acetic acid and reduced insulin response in a small group of healthy volunteers. A small group of healthy study participants who ate salad with 5 percent acetic acid vinegar and white bread showed a reduced glycemic response. A small group of patients with Type 1 diabetes drank vinegar (diluted in water) five minutes before a meal, which reduced their blood glucose by 20 percent. However, many of the studies seem to be quite small in size, and the results overall have been mixed. Vinegar can also be irritating to the stomach and cause nausea. The Medscape article warns that vinegar intake should be limited to a maximum of 1-2 tablespoons diluted in water, taken twice daily. Using a straw may help protect your teeth enamel from potential damage. While vinegar may be beneficial, do not substitute vinegar for your medication. Be proactive and speak to your doctor before trying any new health product, natural or otherwise. Your doctor may need to adjust your treatment and monitor your blood sugar more closely if you take apple cider vinegar on a daily basis. Talk to your doctor about whether vinegar is safe for you.